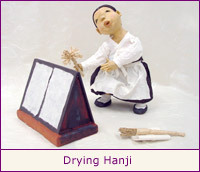 Hanji is Korean traditional handmade paper. 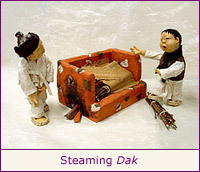 'Han' means Korea and 'Ji', paper. 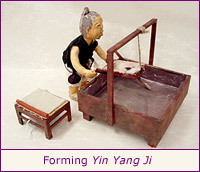 This term was coined only after Yang(western) Ji(paper) was introduced in Korea to distinguish traditional handmade paper from machinemade western paper. In many aspects, Hanji is different from western paper. Hanji is beautiful to look at and touch, but its true value lies in what is not readily recognizable on the surface. Main material for Hanji is simple: paper mulberry, natural formation aid, and clean water. There are no fillers or additives. Compared to fiber from pulp or other plants, paper mulberry fiber is long, flexible and resilient. Hanji is naturally PH neutral and has uncomparable longevity. This is why Hanji is an excellent choice for projects requiring archival care in addition to surface beauty. 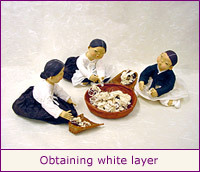 Korea's paper formation technique is distinct. 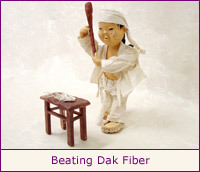 Often referred to as We Bal, this unique technique yields Yin Yang Ji, which has evenly distributed fibers with no dominant grain direction. This means that Hanji is strong, dimensionally stable and does not tear easily in either direction. It maintains even expansion/contraction rate in both directions and does not change final dimensions, which could be particularly useful for paper conservation and certain types of printmaking. Even the lightest Hanji is much stronger than other papers with same thickness. 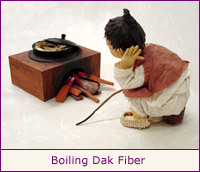 FIDES International brings papers made from several regions in Korea, which are known for producing finest Hanji. All our Hanjis are made with 100% Korean paper mulberry and are PH neutral. Please visit Making Hanji and History of Hanji for more detailed information.